We know how irritating it is to get a lot of email. We promise we won't sell your info or bug you too much. Machine learning is becoming more and more advanced, but it can be improved when applied within a framework of solid classification and analysis methods such as taxonomy, providing much-needed context. 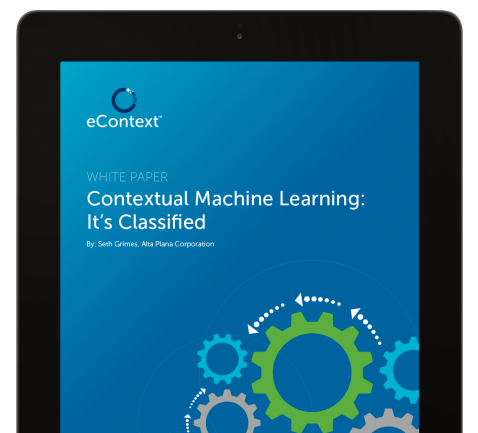 In his latest whitepaper, Contextual Machine Learning: It’s Classified, Seth Grimes discusses current analytics models and shows how they can be supported and enriched by better text classification. He also outlines the five ways that machine learning accuracy can be improved by deep text classification. Seth Grimes consults on business applications of natural language processing, text analytics, sentiment analysis, and data visualization. He founded Alta Plana Corporation in 1997 and the Sentiment Analysis Symposium conference series in 2010. He co-organizes the LT Accelerate conference in Brussels, a European forum for language-technology adoption. Follow him on Twitter at @SethGrimes.com.